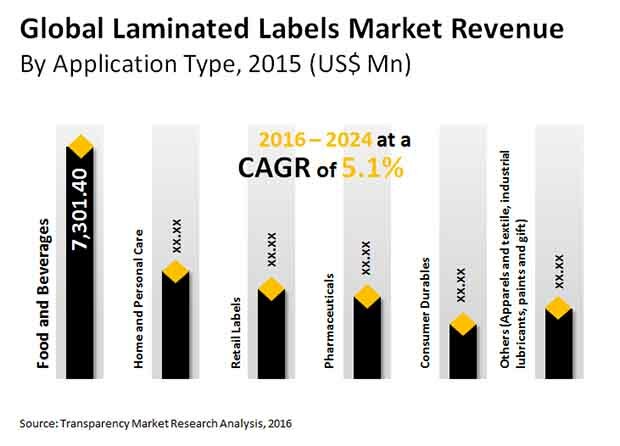 The global laminated labels market is highly competitive and fragmented in nature, states a new market research report by Transparency Market Research. The leading players in the global market, namely Constantia Flexibles Group GmbH, Hub Labels, Inc., Avery Denison, and CCL Label, Inc. are focusing on development of new product in order to maintain their dominance throughout the forecast period. In addition to this, the increasing number of mergers and acquisitions is expected to generate potential growth opportunities for the market players. The competition among the players in the global laminated labels market is expected to get intense in the next few years. The rising competitive level among players can be attributed to the technological developments and the increasing number of players estimated to enter the global market in the near future. According to the market research study by Transparency Market Research, in 2015, the global market for laminated labels was worth US$20.02 bn. The market is estimated to reach a value of US$30.97 bn by the end of 2024, exhibiting a healthy 5.10% CAGR between 2016 and 2024. Among the key regional segments, Asia Pacific is projected to account for a massive share of the global laminated labels market in the next few years. This region is projected to offer potential growth opportunities for the market players. The demand for laminated labels is expected to increase by 1.5 times throughout the forecast period, thanks to the increasing use of laminated labels across diverse applications. According to the research study, the market is likely to register a 5.30% CAGR between 2016 and 2024. North America and Europe are projected to follow Asia Pacific in the coming years. The presence of a large number of players and the growing demand are the major factors that are estimated to encourage the growth of the laminated labels market in North America and Europe. Among the key end use segments, the food and beverages industry is estimated to emerge as one of the most promising segments in the global laminated labels market. This segment is projected to account for approximately 35% of the overall market throughout the forecast period and is likely to remain in the leading position in the near future. The home and personal care segment is also projected to register a steady growth in the next few years, further followed by the pharmaceuticals segment. The growing demand for packaged food and beverages and pharmaceutical supplies is one of the key factors estimated to encourage the growth of the global laminated labels market throughout the forecast period. The increasing awareness regarding the advantages of using laminated labels and the rising demand from the consumer durables are further projected to accelerate the market growth in the near future. On the flip side, the printing on the package itself and a significant rise in the cost of raw materials are anticipated to restrict the growth of the global laminated labels market in the near future. Nevertheless, the rising potential growth opportunities from several emerging economies around the world and the development of new products are expected to accelerate the growth of the market. In addition, the development of the e-commerce industry is likely to act as a key opportunity for the market players. The rapid development of the e-commerce industry to boost the demand for laminated labels in the next few years. Asia Pacific to lead the global laminated labels market and is predicted to remain dominant in the coming years.